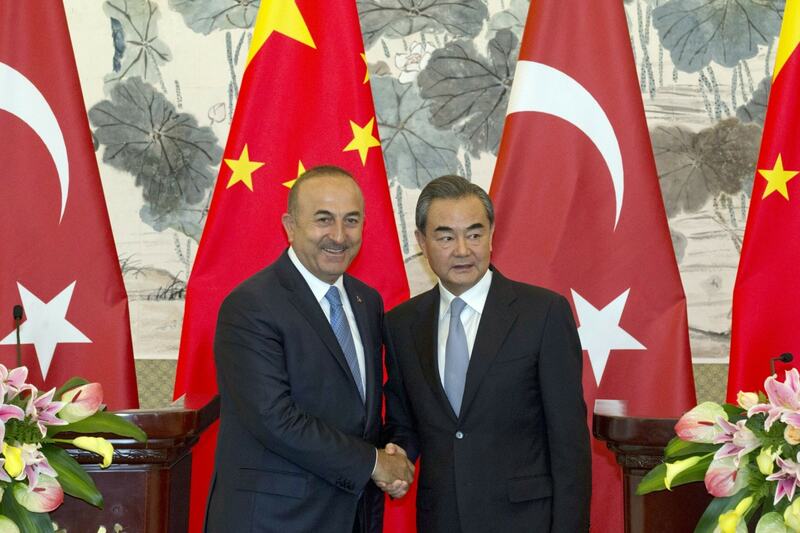 BEIJING — Turkey’s top diplomat vowed Thursday to root out militants plotting against China, signaling closer cooperation against suspected Uighur militants hailing from China’s far west who have long been a sore point in bilateral relations. Turkish Foreign Minister Mevlut Cavusoglu told reporters during a visit to Beijing that his government would treat threats to China’s security as threats to itself and would not allow any “anti-China activity inside Turkey or territory controlled by Turkey.” Cavusoglu’s tough comments, which came after a meeting and warm handshakes with his Chinese counterpart Wang Yi, were seen as referring to China’s Uighur ethnic minority, a Turkic people who share cultural and linguistic ties with Anatolian Turks. Turkey and China have in recent years pledged to cooperate on security and counter-terrorism efforts, though experts say such ties are also balanced by mutual suspicion. Relations between Ankara and Beijing have been strained by Turkey’s support for groups fighting Syrian President Bashar al-Assad — a China ally — and its sheltering of Uighur refugees.